Make this restaurant style palak paneer recipe in under 30 minutes. Palak Paneer (spinach with cottage cheese) combines spinach with cottage cheese to make this delicious meal that goes well with rotis or naan. Get this recipe to make restaurant style palak paneer at home. And, Instant pot fans, you can totally make this in an Instant Pot. Palak Paneer (Spinach with cottage cheese) has always been standard fare in Indian restaurant buffets in the US. Some of these restaurants make this curry spectacularly well while some smother it with so much cream that you can’t taste any spinach/palak at all. My version does not use any cream at all but tastes just like the original without the extra calories. 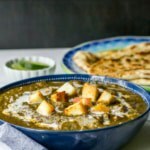 How to make restaurant style palak paneer gravy at home? There are so many ways you can make palak paneer at home and here are the different variations that you could try to tailor the recipe to your taste. Keeping spinach green after cooking -Blanching helps retain the green color in the spinach. To blanch, add spinach along with a pinch of salt to boiling water. Cook for a couple of minutes or till the stem softens. Immediately transfer it to a bowl of cold water to stop cooking. Blanching causes nutrient loss that is why I prefer to cook the spinach and use the water to puree. Shallow fry Paneer – you could shallow fry the paneer/cottage cheese to make the paneer crispy from outside and soft from the inside. It also gives it a nice golden color. You can also use paneer as-is to give you that soft melt-in-the-mouth texture. Spinach puree – you could puree it till it is smooth or just pulse grind it so that you get some texture. Personally, I like the one with some texture but the pureed version is definitely the more popular one. Creamy palak paneer – Add cream when the palak paneer is cooked to make it extra creamy. If you prefer a healthier version, add 1/4 cup unsalted cashews along with the tomatoes and puree it with the rest of the ingredients. Restaurant style palak paneer recipe - This Indian vegetarian dish is popular with folks in India and abroad. Get this easy and healthy recipe to make restaurant style Palak Paneer (Spinach with cottage cheese) at home! In a saucepan kept over medium heat, add a cup of water and once the water comes to a boil, add spinach and let it cook in it for 2 minutes or till the stems soften. Turn off the heat and set it aside. [I cook the spinach and don't blanch it. To blanch, read the notes section]. Meanwhile, heat oil in a wok or a kadhai kept over medium heat. Shallow fry the paneer cubes till they turn golden brown. Fry them in batches if needed. Using a slotted spoon transfer the paneer to a plate. In the same wok, add cloves, pepper and bay leaves and fry them in the oil (remnants from frying paneer). Add onions and fry them till they turn soft. Add salt, garlic, and ginger and fry them for a couple of minutes before adding tomatoes. Fry the tomatoes till they are soft. Turn off the heat and let the mixture cool down for 5-10 minutes. Transfer the onion-tomato mixture along with the spinach (and the water it was soaked in) into a blender. Blend it into a smooth puree. Add the pureed mixture to the wok and set it over medium heat. Add cumin, coriander and chili powder and mix well. Once the mixture comes to a boil, add garam masala and sugar and stir it in. Gently place the paneer in the gravy and spoon over the gravy on it. Simmer the gravy for 5-10 minutes. Take it off heat and serve hot with rotis or rice. Once the water comes to a boil, add spinach and let it cook in it for 2 minutes or till the stems soften. Press “Warm / Cancel” button and transfer the spinach to a bowl along with the water and set it aside. [I cook the spinach and don't blanch it. To blanch, read the notes section]. Shallow fry the paneer cubes till they turn golden brown. Fry them in batches if needed. Using a slotted spoon transfer the paneer aside on a plate. Add bay leaf, black pepper, and cloves in the oil (remnants from frying paneer) and let it fry for around 30 seconds and then add onions and fry them till they turn soft. Add salt, garlic, and ginger and fry them for a couple of minutes before adding tomatoes. Fry the tomatoes till they are soft. Press “Warm / Cancel” button and let the mixture cool down for 5-10 minutes. Transfer the onion-tomato mixture along with the spinach (and the water it was soaked in) into a blender. Blend it into a smooth puree. Add the pureed mixture in the steel insert of the Instant Pot and press the Saute function. Press the Adjust button to move the selection to “Medium” and once the display reads “Hot”, add cumin, coriander and chili powder and mix well. Once the mixture comes to a boil, add garam masala and sugar and stir it in. Gently place the paneer in the gravy and spoon over the gravy on it. 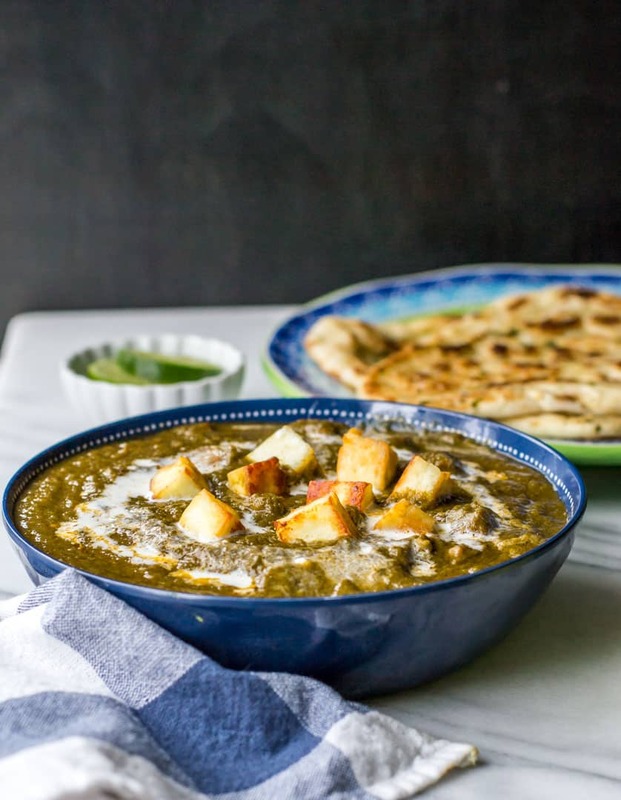 Select warm/ cancel and let the palak paneer recipe simmer in the Instant Pot for 5-10 minutes. Take it off heat and serve hot with rotis or rice. Blanching helps retain the green color in the spinach. To blanch, add spinach along with a pinch of salt to boiling water. Cook for a couple of minutes or till the stem softens. Immediately transfer it to a bowl of cold water to stop cooking. Oh my goodness~! This was amazing…but so many steps. I appreciate this divine green gravy even more now! Will order out and only make for folks who truly appreciate Indian food. Sure will give it a shot soon. Thanks for stopping by! Great website for newbies.. Can you please put up a recipe for Paneer Paratha..